Pictures from the last weekend. I love to stroll around fleahmarkets at the weekend. In zurich you can visit the one with a lot of rather cheap stuff, which is taking place at the Helvetiaplatz. You can find some "trouvailles" as well, if you have enough time to look after them and you won't pay much. Another Fleahmarket at the Bürkliplatz is a little more sophisticated. There you can find many Vintage or Secondhand Designer Pieces. In the Gerolds Garten in Zurich there is kind of a "hipster" fleamarket in a city garden. There you can sit and have a coffee or a drink and shop at the same time. This one starts at 10 a.m., so you won't have to get up as early as for the other ones. Of course there are many more little places where worn stuff is being sold, but these are the ones I like the most. We shot the Pictures beside the Metropol Restaurant in Zurich. Not the place I often spent time - but I love the Architecture of this Building. I've seen some pictures of the famous Swiss Blogger Girl Kristina Bazan around this place - maybe you'll see her around if you're lucky. 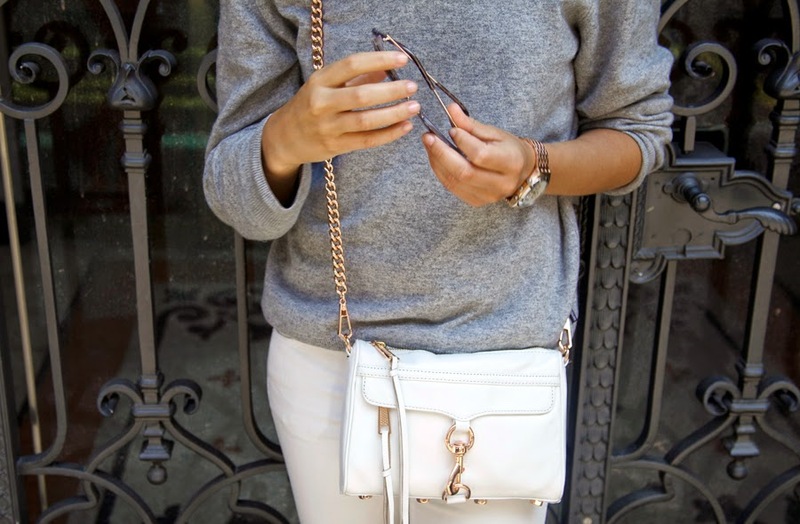 I'm wearing a grey cashmere sweater, white jeans and comfy shoes. Some similar basic pieces like mine you can find at Esprit. They do have this effortless chic in every collection. Like striped sweaters ore basic one colored jeans and sweaters. I love to combine new basic pieces with some lovely vintage pieces from the fleahmarket. How about you? What do you recommend for your own city? That's exactly how i've spent the last weeks in the library. Comfy sweater, jeans and sneakers. The sweater is from Pazza Idea, a sweet little online store with some very special pieces. One of my readers can win a 150CHF Giftcard from the shop. Just write me a comment below this post with your email. To take part, you should be following my blog via bloglovin or blogger. I finally had time to do some interior decoration. I ordered some lovely stuff at Westwing Home and Living. You have special prices on beautiful stuff. From furniture pieces like vintage and re-worked classics - you can find almost everything. They do have very romantic and tacky styles as well as some high class design pieces. I picked a black sheep fur to embellish a simple chair, and some cute New York Cups for Teatime. Some candles will soon arrive at my home, to complete my order. To see what they sell, you need to register, so its kind of exclusive for members. Like this you have always a chance to get a hand on the rare stuff, because there aren't to many people on the page at once. And the offers are always only available for a limited amount of time - so don't miss your favorites. Check it out - I'm looking forward for a bigger flat so I'll have space for all those beautiful items. I have a special gift for my readers - if you follow this link to the westwing home and living page, you get 15CHF off on your first purchase. 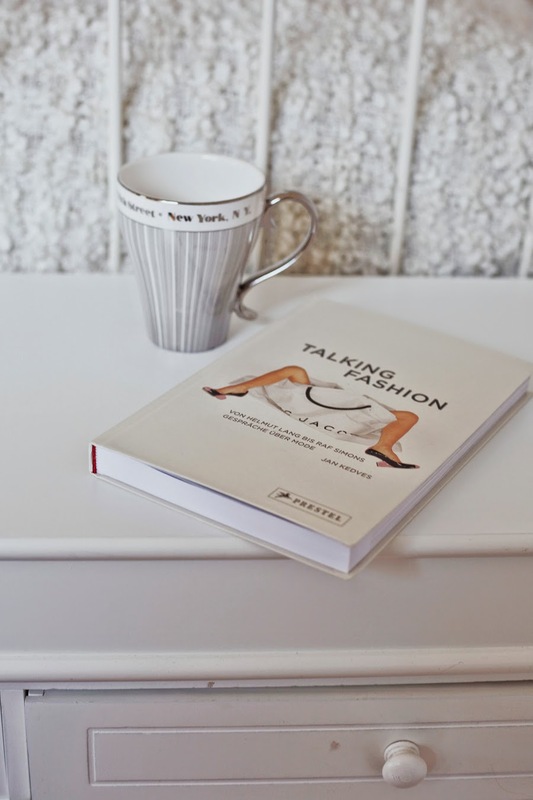 Book Talking Fashion - Von Helmut Lang bis Raf Simons - Gespräche über Mode. Prestel Verlag. 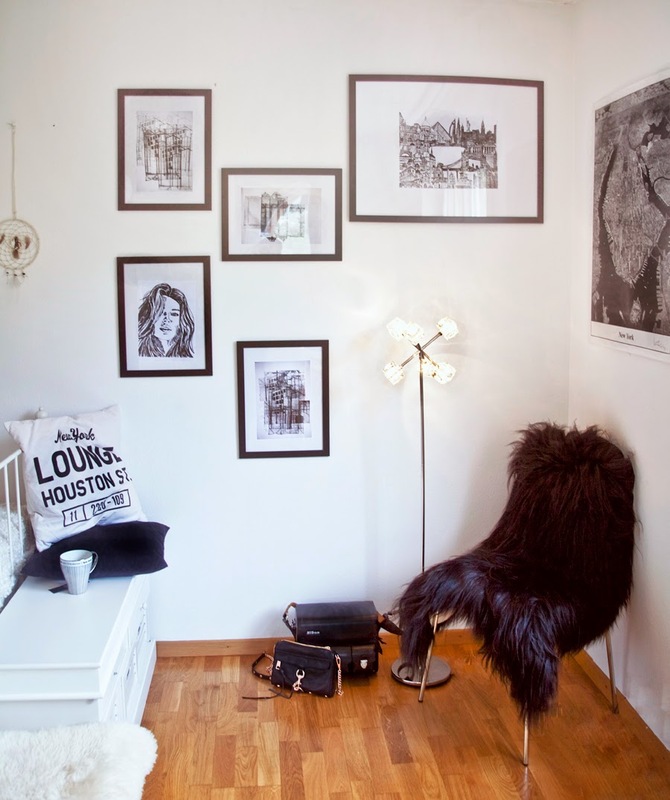 Gallery Wall and some comy pillows. My Outfit for Art Basel 2014. It was so funny to go there on the preview day. So many dressed up people. In and outside the halls, it felt like being at a Fashionweek. Artsy People do have a lot of style. Or at least they know how to play with clothes. I preferred a very comfy but yet stylish outfit. The slippers from Vagabond are the most comfortable "non sneakers" I've worn lately. 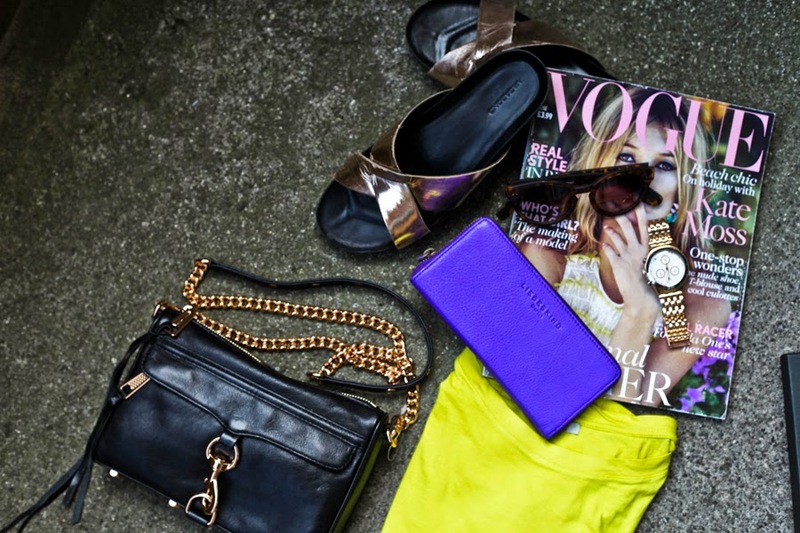 Summer Essentials 2014 with Zalando - Purple, bronze and some stylish Glasses. My personal summer essentials for 2014. I've chosen my most beloved summer accessories on Zalando to complete the perfect summer outfit. The cheerful colors come back every year in summer. What would be summer without them. The purple Liebeskind "Sally Vintage" wallet fits perfect to colored nails and a some gold jewelry. Add a fancy lemon green shirt and you're almost doing the color blocking thing. Some 50ies Shades are always in style, so they shouldn't be missing for your perfect beach day. The Vagabond Erie Pantolettes are the must have shoes for summer. They are very comfortable, I was able to walk long distances and my feet were still happy. As I am wearing my bronze swatch chronograph almost daily, they build the perfect color matching team togheter. I love it, when things are easy to combine. So thats why these pieces are my summer favorites. 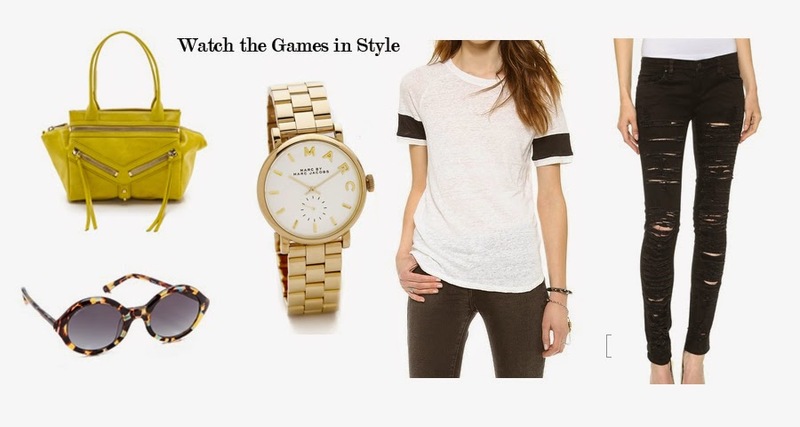 Watch the Games in Style with Shopbop. So if you're also one of the girls who likes football every four years - exactly when the World Championship takes place, you should read this post. - if you need to hide yourself, if the game should be boring - against your expectations - or to watch all the pretty soccer guys without someone to notice. A watch (Baker Watch Marc by Marc Jacobs) to be aware of the time. You need to know, how much time is left. A comfy shirt, that gives your look that sporty and effortless touch (IRO Jeans Vendela Tee Shirt) and some ripped jeans (Blank Denim Ripped Skinny Jeans), to look cool while following the game. So what is left: go Switzerland - and go Germany! 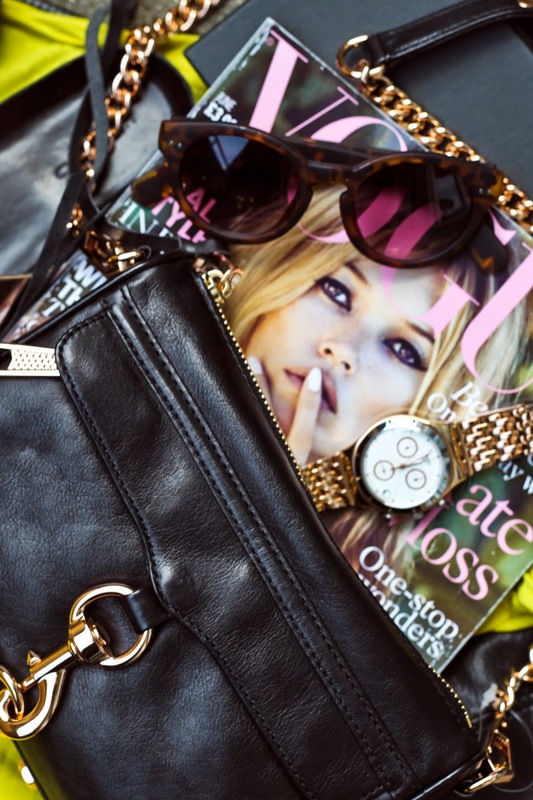 At Shopbop you'll find more Minkoff Bags - among several other beauties. After quite a long time with few words from my side, I'm back. I'm thankful to finally have some time for the creative part of living again, since my exams are over now. Some lovely details about my summer accessories. I'm in love with my new swatch chronograph. It fits almost every outfit. The watch is from the current summer collection. 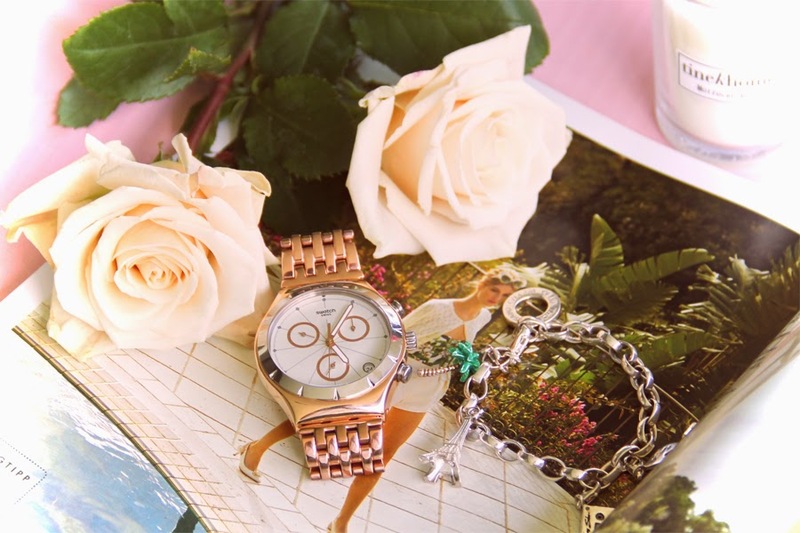 With my Thomas Sabo Bracelet with palm pendant, they form the perfect summer combo. Flowers and bright colors, and of course a lot of nice fashion stories will be part of the next weeks on the blog. I hope you enjoy the beginning of the summer as much as I do. In the Pictures my beloved Swatch Pushback.